Behaviour: Antipredator behaviour, cooperation, vocal communication, species interactions, animal welfare. Whether a prey animal hides, flees or counterattacks when faced with an approaching predator influences myriad aspects of its behaviour, ecology and even psychology. Previously, I discovered large differences in cooperative behaviour between two deer species that are similar in size and closely related. Mule deer females engage in a highly aggressive and cooperative defence against coyotes. They defend fawns that are not their own offspring and will even defend fawns from another species, white-tailed deer. In contrast, white-tailed deer females only move toward the site of an attack if there is a possibility that their own offspring is the victim. My students and I showed that protection by mule deer females reduces the risk of capture for both mule deer and white-tailed deer fawns and that white-tailed deer females actively deposit their fawns within mule deer groups, apparently using mule deer females as baby-sitters. Our research has led to breakthroughs in understanding how prey behaviour influences predator hunting success and, in turn, populations of prey and the predator-prey community. We used observations of coyotes hunting deer to show that differences in a prey’s tendency to flee or to fight influences the type of groups and habitats in which prey live. The different tactics prey use against predators even influence the time of year when fawns are most vulnerable to predators, thereby shaping the predator’s feeding habits and annual survival patterns for the prey population. Much of our work has been directed to understanding variation in cooperation and parental care, both from adaptive and mechanistic perspectives. Typically, it is the distress call, or cry, of a fawn that elicits a response by mothers. By using these cries in playback experiments with free-ranging deer, we ruled out traditional explanations for the mule deer’s defence of non-offspring such as misdirected parental care or kin selection. We recently found that mule deer and white-tailed deer mothers respond to conspecific distress calls as long as the pitch, or fundamental frequency (F0), fell within 50% of the mean F0 for newborn fawns. We then discovered that females respond to the cries of an extraordinary range of mammalian species, including seals, bats, marmots and human infants, as long as the F0 falls, or is manipulated to fall, within the deer’s species-specific range (see videos below). They did not respond to control sounds having the same F0. These results suggest that acoustic traits of a newborn’s cry that are essential for a response, and a caregiver's sensitivity to these acoustic features, are shared across diverse species of mammals. We are testing whether mechanisms underlying the production and processing of vocalizations made by different species and vocalizations made in different behavioural contexts are conserved across species. We are doing acoustic analyses and playback experiments to identify the specific acoustic traits that characterize “cries”, how cries are similar or different across species, and how cries are similar or different from vocalizations made in different behavioural contexts. We are running parallel sets of playback experiments with deer and with humans. 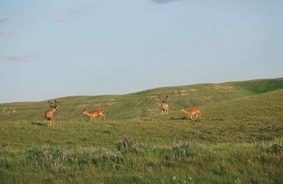 We obtain data on behavioural responses when conducting conducting playback experiments with deer (see videos at right). We obtain data on emotional and physiological responses (heart-rate, hormonal assays) from human volunteers. Applications: The work we are doing on evolutionary continuity in parent-offspring communication has several potential applications. First, it lends insight into bonds formed between different species. As humans, we sometimes empathize with other species, especially the young, and we tend to credit our superior reasoning abilities for this sentiment. This research suggests that the response to infant cues may instead be the result of sensory mechanisms shared across mammals through tens or hundreds of millions of years of evolution. This type of finding underscores the commonality between humans and other animals, and scientific credence to bonds formed between humans and animals, or between other animals. Second, as we examine the effect of cries and other sounds on animals and humans, we can identify sounds that induce or relieve stress, and use this to improve the design of the sound environment, which will be especially helpful for wildlife or domestic animals living in captivity. Third, we anticipate using our results to design informed fostering programs for orphaned animals, which can be applied to animals living in wildlife rehabilitation centres or domestic animals. Please contact us if you are interesting in helping to support a research trainee conduct this work. Video 2. Mule deer response to original eland call. Video 3. Mule deer response to manipulated eland cry. Video 4. Mule deer response to manipulated bat cry. Video 5. Mule deer response to human baby cry. Video 6. White-tailed deer response to fur seal cry. We are grateful to many people who generously provided recordings for use in acoustic analyses or playbacks: Dan Blumstein (marmots), John Byers and students (pronghorn); Isabelle Charrier (fur seals and sea lions), Jack Hogg (bighorn sheep), Ben Pitcher (seals), Paul Faure (bats), Alan McElligott (fallow deer), Elodie Briefer (goats), Radim Kotrba (cervids and bovids), Joah Madden (meerkats), and Dan Mennill and the Mennill Sound Analysis Laboratory (bird distress calls), Radim Kotrba (eland and other ungulates). We thank the following people for making arrangements so that we could record their study subjects or animals under their care: Jim Hare (ground squirrels), John Byers and his students (pronghorn), and Chris Enright, Charlene Berkvens, Robert Wrigley and other members of the animal care staff at the Assiniboine Park Zoo. We are beginning a major new project in the lab, rekindling an interest and data set I began when working with hybrid white-tailed x mule deer. Our goals are to identify ecological conditions (e.g., population density, geographic overlap) and mating tactics behavioural tactics that prevent or facilitate hybridization between mule deer and white-tailed deer. These data will enable us to make specific management recommendations about conditions needed to minimize interbreeding between the species. When doing this work, we will have the opportunity to investigate the potential role of social interactions and mating tactics on the transmission of Chronic Wasting Disease (CWD). CWD is a fatal prion disease that is spreading across deer populations in North America. The resulting data will help us identify characteristics of habitats and deer populations that would most likely result in an increase in CWD, which can be used to develop specific management strategies to reduce the spread of disease. This is an ambitious project and we have three lab members poised to begin work including M.Sc. student Jason Airst, technician Kelsey Saboraki, and Postdoctoral Fellow Agnes Pelletier. While Jason is supported by the University of Winnipeg and Department of Biology, we need funding for Kelsey and Agnes to plan and conduct fieldwork and data analyses. Please contact us if you are interesting in helping to support this project and the work of these students. 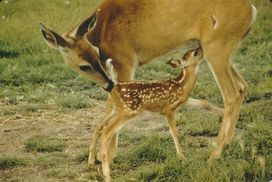 Hybrid female nursing her fawn. Two white-tailed deer females scamper between a pair of mule deer bucks. Unparalleled observation conditions at the McIntyre Ranch study site make it possible to witness the deer's social interactions. 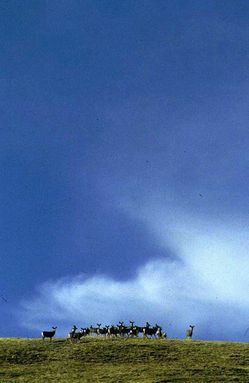 My students and I continue to use an exceptional field site and a long-term data set on the coyote, deer and ground squirrel populations to examine the influence of specific prey behaviours (e.g., cooperative defence versus individual flight) on coyote hunting success, fawn survival, the deer populations and and the larger predator-prey community. This work is based on the prairie grasslands of western Canada where we have the unique opportunity to observe coyotes as they hunt deer and other prey species.